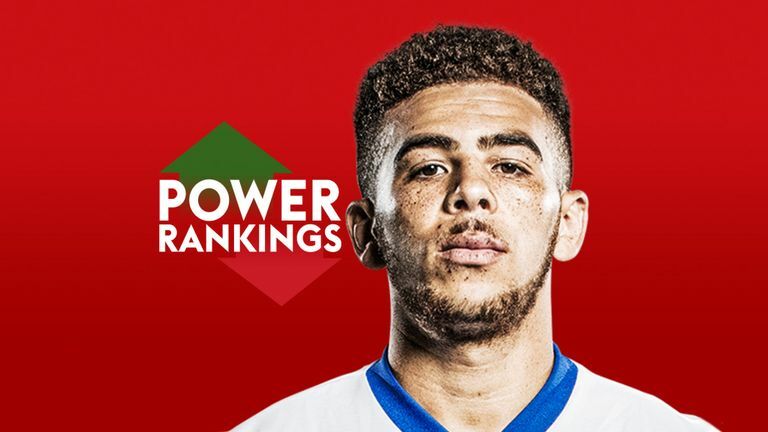 Birmingham City forward Che Adams has topped the Championship Power Rankings this week. The 22-year-old hit a hat-trick during a 3-3 draw with Hull at St Andrew’s, ending team-mate Lukas Jutkiwicz’s (No 4) five-week reign atop the chart. Reading’s Yakou Meite (No 2) scored an overhead kick and headed a late leveller in a 2-2 draw with Ipswich, while Stoke goalkeeper Jack Butland (No 3) kept his third successive clean sheet in a goalless stalemate at Nottingham Forest. Norwich striker Teemu Pukki (No 8) scored twice in a dramatic 4-3 victory over Millwall – making amends for missing a penalty with a 97th-minute winner – with team-mate Emiliano Buendia (No 5) retaining his place among the top 10. Hull City striker Fraizer Campbell (No 6) fired his way up the chart with two goals in the 3-3 draw at Birmingham, while Preston’s Callum Robinson (No 10) scored the winner at Bristol City to book his place among the elite performers. Below, we present the in-form chart based on performances over the past five Championship match days (with greater weight placed on recent games), your club’s top points scorer and the season accumulative chart.